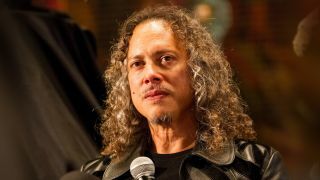 Kirk Hammett lost 250 ideas for Metallica’s 10th album when his phone went missing, he’s revealed. And he’s still hoping the handset will turn up, six months after he mislaid it with rough recordings in its memory. Hammett tells The Jasta Show: “I lost my iPhone with 250 ideas – and I was crushed. It didn’t get backed up. Metallica return to the UK to headline the Reading and Leeds festivals in August.